I interviewed a woman named Claudia Sasser for my project. She is a business graduate from University of Georgia. Claudia is a woman who is relatively new to the wedding planning business. She is the meeting and events manager from her self-owned company Claudia Sasser Events. I met Claudia through my mother; they used to coach gymnastics together. She was kind enough to participate in a phone interview with me. My interview with her was very insightful and taught me a lot about the industry. I found the interview to be especially informative since I am interested in a career in event or wedding planning. I learned how difficult it is to get started and just how important social networking really is for this career choice. What’s a typical work week like? Well work is slow right now since I am just getting started and I have a very young daughter. Right now I really have to do most of my work around her schedule. I am working independently so right now I am just researching a lot of the time and trying to get my name out there. Can you tell me about a project you have worked on that you are especially proud of? I have been really proud of the fact that with all the weddings I have planned I was able to stay within the client’s budget. It is a lot more difficult to stay within budget than most people would think. How important is writing in your career? Writing is actually very important. I have to e-mail back and forth a lot with vendors. And I have to be able to know how to get the price I want. I also have to write to try and make my name known. What 3 tips would you offer someone who is just starting out? I would say that you need to be ready to put in a lot of time. You need a lot of patience. And you really need to know your market, the ages and the demographics you’re trying to appeal to along with what type of events you want to do. Did your education prepare you for your work? Well, I graduated from the University of Georgia with a business degree so I didn’t have any courses that specialized in this type of work. However, business skills have definitely benefited. What has surprised you most about your work? The liability involved. It is very important that you have a lawyer in order to protect yourself. They will help you compose a contract with your clients that will ensure you don’t lose money or put time into a wedding just to have it cancelled. An example of how having protection is if the guests were to get food poisoning from the food served at the wedding. Although it is the caterer who served the food, you are the one who hired the caterer. How has technology affected your daily work? I am constantly on the computer as well as the phone. Whether it is to research, or e-mail vendors or book locations, I am always using technology in my work. It is something that is needed every day. What is your most or least favorite part of your job? Surprisingly, I really enjoy the stress of it all. I love the feeling I get with managing an entire project. Luckily, I haven’t yet come across something I dislike that much about my job. This week’s blog topic for my Public Relations Practicum class is Internship advice. I think that this is a good topic because many of the students in this class have already interned or are about to begin applying for intern positions. Those that have already had internships can share their experience with those that haven’t yet. They can help them to have a better understanding of what to expect and how to prepare. Since I haven’t held an internship position yet, I searched online for internship advice. The first site I looked at was: http://www.groovejob.com/resources/internship/importance/. This article begins by stating how hard it is for new graduates to get good jobs once they are directly out of college. They say that it isn’t which university you graduated from, but what actual real world experience you have. Their advice on how to get this experience? Get an internship. 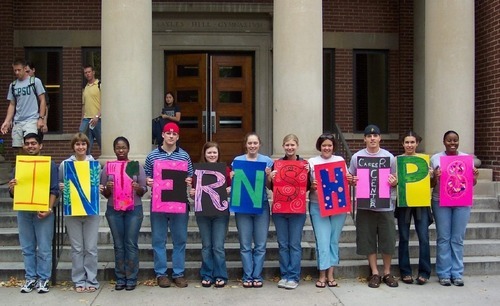 Internships are the best way for college students to gain actual experience. An internship will provide insight into a real work environment. Now that I have highlighted the importance of an internship, I looked at http://www.magicpotofjobs.com/2009/03/24/internship-advice/. for information about how to get an internship. This article suggested that the best time of the ear to look for an internship is during the “off” season. This is the time when there is not a break in school, such as summer. Times during student beaks are the most competitive times to try and get an internship. So if you are wishing to intern during this time, you should start applying early. The article mentioned that you should go to the career services office at your school or someone that can help provide you with a list of companies which are looking for interns. These companies are usually looking for college students and sometimes have more than one intern position they are trying to fill. After scouting out possible internships, it is time for you to start researching the companies you are interested in applying for. If you are fortunate enough to get an internship interview then you want to know background information about the company. This way you can ask your interviewer in specific questions. This will show that you have taken the initiative to research prior to getting the position. Prior research may also be able to help you understand what will be expected of you if you are hired, it can also help you decide where you want to apply. Once deciding where you want to apply, you should have someone (an advisor, career services, etc. ), assist you in creating a resume and cover letter which are geared toward the particular internship you are applying for. After you have applied, you should begin preparing for the interview hopefully to follow. Make sure you are well prepared before you step into an interview. If you do not make a good impression during your interview, then you might not get the internship. Remember to research the company prior to the interview and dress appropriately. For more advice on how to prepare for an interview you can view some of my previous blogs. I enjoyed your post. Originally, I never thought of a cover letter as a way to show a future employer a little of who you are. However, you made an excellent point when you mentioned it. I agree that it is important to show who you are as a person not just and employee. Employers are probably interested in knowing the type of person they could potentially hire. Certain characteristics could make or break you. I think that when using personal information about yourself in a cover letter you should do so with digression. Make sure personality points about yourself are appropriate and portray you in the light you wish to be portrayed. 2.Here is the link to my comment on Meghan’s post about body language and non verbal communication. I think there is good advice in what your mother told you in regards to the importance of first impression in an interview. I think that people are constantly under estimating the importance of first impression. Your post on proper body language and non verbal communication provided useful information on how to improve your first impression. 3.Here is a comment I left about tips for how to dress for a job interview. I found the video you posted within your blog to be very helpful. It was easier to watch the video than read posts about what to wear to an interview. I think the video covered all the main questions people have in regards to dressing prior to an interview. 4.Here is a link to the comment I left on Sarah’s post. I really enjoyed reading your blog on internship advice. It is difficult to find the right balance between speaking up and stepping on toes. I think as we are nearing the end of our college days we are also nearing the time to start internships. It makes me nervous to hear many people in our classes talking about their internship interviews but it also makes me excited. The advice your provided on how to get an internship is helpful, thanks! I thought your post on cover letter tips was very informative. I also thought that the tip about including social media skills in your cover letter was interesting. I hadn’t thought about including these types of skills in a cover letter, but now that you have mentioned it I can see why. Especially when you are applying for a position involving public relations work. I thought that your post was more interesting than others on the same topic because you actually talked about your friends who have interned. I also liked the way you incorporated their personal advice they wish to share from their personal experience. Also, the was you wrote your post was more conversational. I though this made it easier to read and follow along with what you were trying to get across. I definitely agree with the comment you made about proper grammar use and proof reading your cover letter prior to submitting it. I do not think that the importance of this tip can be emphasized enough. Many interviewers will through out a resume without taking a second glance at it if they notice improper grammar in the cover letter. Although this tip seems basic and common knowledge it is still one of the most important tips of advice for a cover letter. I found this interview to be very informative. I think I enjoyed it more than other interviews I have read because I can relate to it more than the others. I think that it is more appealing to me because the interviewee is a Georgia Southern graduate. I feel like I am constantly hearing others say that people who graduate from other “more challenging” schools have a higher chance of getting a job than GSU graduates. Marla is an example proving that this is not the case. You can graduate from GSU and still get a good PR job. It is encouraging to hear her thoughts and the description of her job. I enjoyed your post about the interview you conducted. As I commented on another blog where a student interviewed a Georgia Southern graduate, it was encouraging. I like to read about successful careers people with PR degrees from GSU have accomplished. I also was interested when you asked what advice she would give, and she mentioned “Take the PR Publications class”. I am taking this course next semester, so the advice has made me look forward to taking the course. I also liked the fact that she is a relatively new graduate. She hasn’t been out on her own that long and she has already had success. It gives me hope. Wow, this Career Services Event really sounds like it provided you with good, helpful information. It seems like it is the type of workshop that every student could benefit in some way from . I wish I had known about the event because I would have benefited from attending. That’s why when you mentioned you were the only student who attended I was surprised. I fee like a lot of student’s would have been interested in attending if they knew more about the event. Maybe the Career Services Department should find a better and more effective way of informing student’s of such workshops. It sounds like you really learned a lot from the workshop and I think that in the future if more student’s knew about similar events, the attendance rate would be much higher. I think that the event you attended was a good choice. Prior to this semester I had not yet hear of LinkedIn. I heard about it through our Practicum class when we had to create a LinkedIn account. I think that the event you attended would have benefited me because I still have some questions about the site. It is nice to be able to read your post and have a lot of my basic questions about how the site works and how to use it answered. This is a great post. I found it very helpful. Thanks! I enjoyed your interview. I thought is was original in the aspect that you though to interview someone who is still a college student. It goes to show that you can never be too young to start working on your career. I can’t believe he began working with PR at the age of 16. I also though that the post was interesting because the things he has accomplished were things that many Pr students are also capable of accomplishing. I think that a lot of students think that they need to wait to graduate before they can pursue their careers but as Carter proves, this is not true. I enjoyed your blog post about your interview. I liked the fact that you used a Georgia Southern graduate. It is always easier to relate to the person you are reading about in an interview knowing that they came from a similar education background as yourself. I also like the fact that you were fortunate enough to be able to conduct your interview face to face. I had to do mine over the phone. While my interviewee was very helpful, I wasn’t able to have that same type of personal contact you have when face to face. It sounds like she sure does keep busy with her work. I guess our professors aren’t lying when they say we better get used to writing. After reading your post, I fell like you do. I am ready to graduate and get out there! I found your post in internship advice to be very helpful. Since you have already experienced working as an intern not just once, but twice, I found you to be a credible source. It is refreshing to have someone who has already been there and figured it out for them self, to provide insight. I agree with you completely that an internship provides a great opportunity and that it can give you an idea of the “real world” and what to expect once you are in the work field. I also thought that then advice to include social media skills was helpful. As time are changing so is the high level of importance of social networking sites in the PR world. Potential employers would like to know that you posses the skills to navigate through these sites. I found this post to be informative. The importance of something as simple as eye contact can not be stressed enough. I always knew that it was respectful to look a person in the eyes. I also knew that it is not polite to stare. However, I didn’t realize that if you look directly into someone’s eyes for too long that this is a sign of aggression. It is a helpful fact to now because I know I personally don’t want to come across as aggressive. I also loved the graphic you used in this post. It fit perfectly with what you were talking about. Wow! it sure sounds like Chelsea is kept very busy with her job. I like that she is a Georgia Southern graduate, and that she is a relatively recent graduate. I also liked the type of work she does. It sounds like she does so many different aspects of Pr work which I find intriguing. Also the fact that she mentioned social media in part of her job description was interesting. I feel like our professors are always telling us how important social media is in the PR world but it is nice to actually hear from someone who knows first hand. I enjoyed reading your post on the benefits and pitfalls of social media. I completely agree with what you mentioned as the pitfalls of social media. You definitely do have to closely monitor what private information you are putting out there on these sites. Which is one of the things that also bothers me about social media sites. I use sites like Facebook for recreational use. My purpose for having a Facebook account is not to promote myself or make job connections. I use it to connect with my friends and keep in touch with people. However, even thought I don’t use this site for career opportunities, that doesn’t stop potential employers for using my personal information on this site against me. I think that there should be a line drawn between what is considered an invasion of privacy.